I love jewellery. Be they fashion or of the finer varieties because they just add a special touch to the final look of any outfit and accessorising allow you to portry a style that is uniquely you. So throughout the years, I've amassed plenty of earrings, necklaces, rings and bracelets - yes, I have an addiction for them as much as I have for beauty. Now I don't know how most of you store your jewelery but I like mine easily accessible in the mornings after I've dressed so I can coordinate with my outfits. I used to find trinket boxes and the like to store them in but found it hard to pick up a matching pair of earrings amongst the tangle of other earrings or easily take out that necklace without it interwined with other necklaces. I now only store the larger items like chunky necklaces in these boxes and for smaller items like stud earrings and rings, I was looking for a cute plate to store them in. 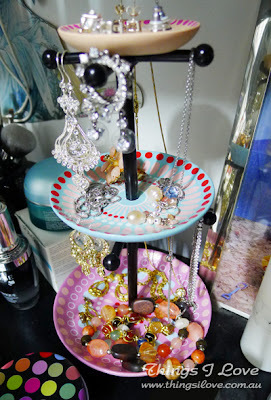 I found this three-tiered plate jewellery holder the other day when going shopping for clothing during the boxing day sale. Each plate is decorated with pretty polka-dot and tear-drop designs and becomes smaller each tier up. 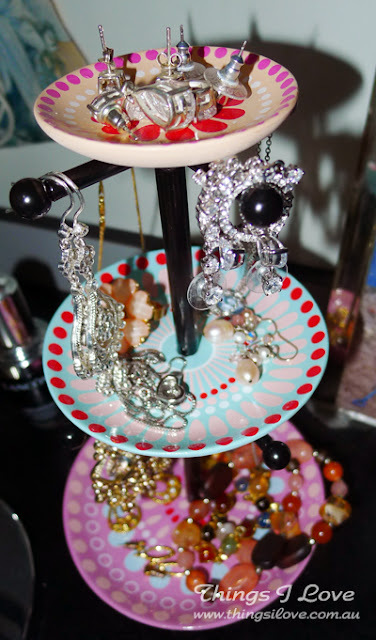 Look how much of my jewellery I've can put on the plate as it's tiered, I can put more things without taking up too much precious vanity space. I also loop necklaces and hook dangle earrings on the side of the black handle bars for added storage- bonus! I haven't really noticed any great deal of tarnishing on my fashion jewellery and I think this has to do with the fact that my vanity is in a dark dry corner of the room (which means I need lights on every morning to put on my makeup), away from the window, sunlight and draughts. I keep them looking shiny by polishing with a silver cloth and and usually by the time the fashion jewellery starts to discolour, I've already moved on to other pieces and ready to retire the incumbent items. How do you store your everyday jewellery items? RRP A$19.95 at Sportsgirl but now on sale and with 50% off sale items, you can pick this up for less than A$10. Be quick as it might not be available for much longer. I have a stand I picked up from Diva before Christmas I think RRP is $9.95. Its good however I like how this one has the flat plate part I need something like that for all my stud earings. I'll have to check this out! I have a mirrored jewellery cabinet that sounded like a good idea at the time. Wow I have been looking for something like this for the longest time! Going to Sportgirl immediately tomorrow to see if I can grab hold of one! Klara - I think I saw the wire stand you're talking about. I think those are great for earrings and the like. I need more storage ideas! Wildewishes - Oh No!! take it to a jeweller and see if it can be repaired, you will be surprised that they can get it back into shape. Cendana - Try some other Sportsgirl store. We have 2 in the CBD and one had none whilst the other one had 6 last time I checked. Not sure if there are many left now though. Tine - I know what you mean about fear of tarnishing but I thought what the hey, I'll just use the silver cloth anyway. The worse I found is getting the jewellery wet or spraying on perfume after putting on jewellery - it discolours alot faster than sitting out on the plates... I mean it is on display in the stores in the open air so you would think that it should be ok.
Faye - haha, which dangly one are you referring to? the Indy looking one or the crystal one with steel posts that I have upside down? Sue - I hope you managed to pick one up too. They are very cute. I was thinking I need to pick up another one if I saw anymore available.